"Enterosgel" is a group of drugs enterosorbents. It has detoxification, enveloping, Antidiarrhoeal properties. The drug rids the body of toxic substances: bacteria and their toxins, alcohol, food allergens, toxins, antigens, heavy metal salts. 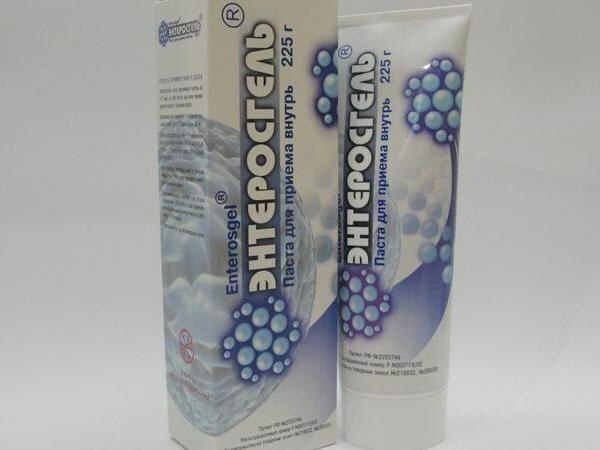 "Enterosgel" is prescribed for intoxication due to chronic kidney diseases (pyelonephritis, polycystic disease, glomerulonephritis), in burn disease in the phase of intoxication, purulent-septic conditions, toxemia during pregnancy, before and after operations on the gastrointestinal tract. It is also used in allergic and atopic diseases (dermatitis, diathesis, bronchial asthma), diarrhea, radiation damage, food poisoning, alcohol intoxication, intestinal syndrome, which was caused by an allergic food intolerances. Means included in the comprehensive treatment of digestive diseases: viral and toxic hepatitis, cholestasis, cirrhosis, Hypo - or hyperacidity gastritis, ulcers, irritable bowel syndrome. A single dose of "Enterosgel" will depend on the age of the patient: adults and adolescents from 14 years need to drink one tablespoon of product (15 g), children aged seven to fourteen years for one dessert spoon (10 g), children from two to seven years – one teaspoon of the drug (5 g), toddlers aged one to two years divided dose in the amount of two teaspoons for three or four doses, children up to one year of the drug given in the number one teaspoon divided into three or four doses. Prior to ingestion of the drug in the form of gel you need to RUB in 1/4 Cup of water and take with water. "Enterosgel" in the form of paste can be drunk in its original form, also with water. The drug is taken three times daily, in between meals, two hours before or after meals. Duration of use "Enterosgel" is ten days in acute poisoning and two to three weeks in chronic intoxications. In severe disease the drug should be taken in double dosage for the first three days. Long-term use "Enterosgel" (more than six months) is allowed in the treatment of jaundice, cirrhosis of the liver. "Enterosgel" may cause nausea, flatulence. In severe renal or liver failure patients may cause disgust to the drug after two or three applications. Means you cannot take in peptic ulcer disease of the gastrointestinal tract in the acute stage, bleeding from the gastrointestinal tract, with morphological disorders in the gastrointestinal tract of various origins (acute expansion of the stomach, atony of the bowel), hypersensitivity to the components. "Enterosgel" should be stored at a temperature of 15 ° C-25 ° C, the shelf life is three years.